The story of the improbable campaign that created America’s most enduring monument. The Statue of Liberty is an icon of freedom, a monument to America’s multiethnic democracy, and a memorial to Franco-American friendship. That much we know. But the lofty ideals we associate with the statue today can obscure its turbulent origins and layers of meaning. Francesca Lidia Viano reveals that history in the fullest account yet of the people and ideas that brought the lady of the harbor to life. Our protagonists are the French sculptor Frédéric Auguste Bartholdi and his collaborator, the politician and intellectual Édouard de Laboulaye. Viano draws on an unprecedented range of sources to follow the pair as they chase their artistic and political ambitions across a global stage dominated by imperial rivalry and ideological ferment. The tale stretches from the cobblestones of northeastern France, through the hallways of international exhibitions in London and Paris, to the copper mines of Norway and Chile, the battlegrounds of the Franco-Prussian War, the deserts of Egypt, and the streets of New York. It features profound technical challenges, hot air balloon rides, secret “magnetic” séances, and grand visions of a Franco-American partnership in the coming world order. The irrepressible collaborators bring to their project the high ideals of liberalism and republicanism, but also crude calculations of national advantage and eccentric notions adopted from orientalism, freemasonry, and Saint-Simonianism. 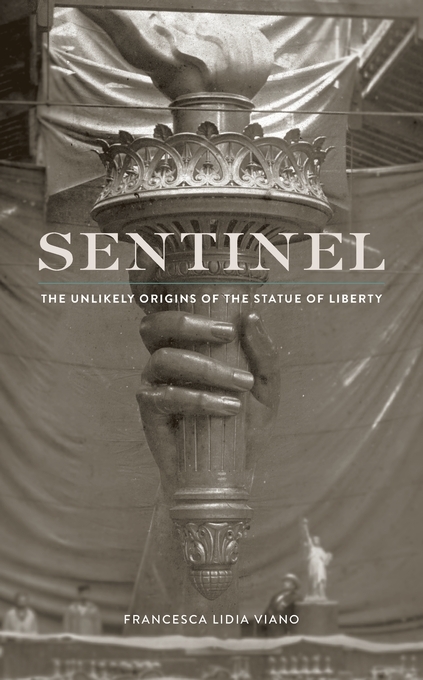 As entertaining as it is illuminating, Sentinel gives new flesh and spirit to a landmark we all recognize but only dimly understand.